Reshma Nishanth and Shanila Satheesh were among the three women who organised the press conference in Kochi in November 2018. Assistant Commissioner A Pradeepkumar had reached the spot when the protests grew and started holding talks with the women. However, they were determined to visit the temple. Bio-medical engineer and social activist Shreyas Kanaran, who was instrumental in helping Bindu Ammini and Kanakadurga enter Sabarimala in January 2, was reportedly among the group that accompanied Reshma and Shanila. Shreyas, a native of Kozhikode, started the Facebook page called Navodhana Keralam Sabarimalaiyilek, a platform to help women who wished to enter Sabarimala. One of the men in the group told the police that initially when they reached Nilakkal, they did not face any protests and devotees let the continue with their journey. However, a little later, a few people started gathering around them and started chanting Ayyappa sharanams. Reshma Nishanth and Shanila Satheesh are from Kannur. 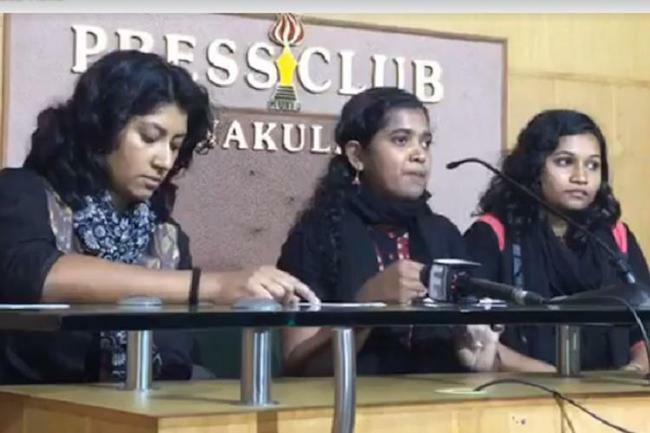 They were among the three women who organised the press conference in Kochi in November 2018, to talk about their wish to visit the Sabarimala Temple. They had also announced that they were willing to wait till the police and the devotees ensured their safe passage to the shrine, to offer prayers. The three women, along with another woman, had even filed a writ petition seeking police security to enter the temple and that the government should reserve three days for women's entry. They had informed the High Court that they had to abandon their plan due to threats from BJP, Hindu Aikya Vedi, Sabarimala Karma Samiti and other organisations. “I wore the mala believing that women’s entry will be made in the best way possible. But since I announced to the world about my decision, my freedom to travel has been completely lost. I couldn’t get out of my home for anything. If I step out of the house, news would immediately spread that Reshma Nishanth is going to Sabarimala," Reshma said in November, while speaking to the media at a press conference amid protests outside the press club in Kochi.